Kossuth, a symphonic poem written by Béla Bartók in 1903, was written in honor of the Hungarian politician Lajos Kossuth, a hero of the Hungarian Revolution of 1848. Bartók’s symphonic poem music tells the story of Kossuth, starting with a portrait of him, recounting the revolution and in the eight movements paints a picture of the Austrians approaching by using a minor key parody of the Austrian National Anthem, the ensuing battle and defeat of the Hungarians. The Hungarian Gypsy Scale is a name given by different authorities to two different scale forms. The more commonly used of these scales is the fourth mode of the Double Harmonic Scale, it can be formulated by sharpening the 4th degree of the harmonic minor scale to introduce an augmented second. The thematic material or Leitmotif of Kossuth is derived from the Hungarian Scale and reappears with different variations and represents both Kossuth as well as the concept of Magyar nationalism. Dance rhythms called verbunkos are hybrids of original musical materials, which are derived from diverse ethnic sources, which originated in the seventeenth century and developed into the nineteenth century Viennese classicism described as style hongrois. Verbunkos are regarded as the ‘soul’ of Hungarian/Magyar Music and contribute to the strong Hungarian nationalistic feel of the Kossuth Symphonic Poem. These rhythms include long-short-short-long choriambus, an accented short-long ‘Scotch Snap’ as well as Kuric fourths, which use a rhythmic rebound between the dominant drone and the tonic in the upper voices. Kossuth Funeral March has an ABA1 form in a minor. An introduction leads into the A section. The Kossuth Leitmotif comes in and is played over the somber double dotted funereal rhythm along with the short short long rhythm of the style hongrois. An ascending sequence with a melodic variation, which is derived from Liszt’s Hungarian Rhapsody No. 2, is the B section. The concluding A section is a coda, which uses a similar chord progression of the introduction. Bartók continued to collect, study and do extensive research on Hungarian folk tunes as well as other countries such as Romania, Transylvania and North Africa. His compositions often reflected his research, and Bartók managed to develop a style that was uniquely his own, which was a combination of his ethnomusicology research of folk tunes and rhythms, a virtuosic and percussive technique, which he managed to skillfully incorporate along with the training he received at the Budapest Conservatory. Bartók eventually migrated to New York City in the USA, sadly due to political turmoil of the time, and struggled to earn a meager living with his ethnomusicology research, piano performances, concerts and compositions. His deep respect of humanity life and nature will always be admired. Although, his music received more praise posthumously, Bèla Bartók’s music continues to educate inspire and delight music lovers worldwide. Harmonies Poetiques et Religieuses is a piano suite comprised of ten compositions, Liszt dedicated the suite to his companion princess Sayn-Wittgenstein. Many innovative concepts are explored in this suite such as constantly changing meters, no key signatures in addition to emphasis on the tritone. Liszt develops these innovations further in his later compositions. Fifty years later Liszt once again returned to the exploration of atonality in his Bagatelle ohne Tonart (Bagatelle Without Tonality). On the autograph manuscript of Funérailles,Liszt writes October 1849. 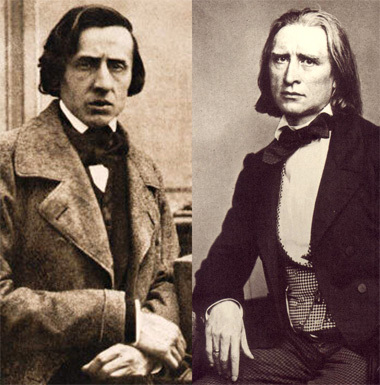 Liszt indicated it was an elegy written as a tribute to three of his friends who died in the failed Hungarian Revolution. Prince Felix Lichnowsky, Count Laszlo Teleki and the Hungarian Prime Minister, Count Lajos Batthyany. It was a colossal defeat to the Hungarian people. The intuitive use of material from Chopin’s heroic Ab Major Polonaise Opus 53 leads to speculation that this piece was more than an elegy to the Hungarian people but also an elegy to his dearly departed colleague F. Chopin.